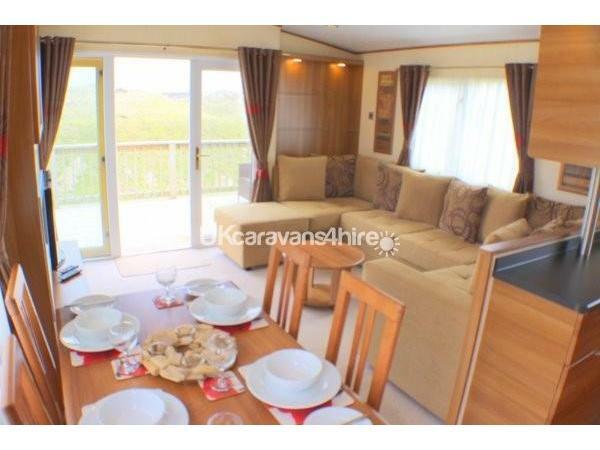 DRIFTWOOD CARAVAN SLEEPS 6 GUESTS VERY COMFORTABLY AND IS AVAILABLE FOR SATURDAY TO SATURDAY HOLIDAYS. Driftwood Caravan is a Platinum Top of The Range Luxury Caravan with a Fantastic Decking Area, situated in a Wonderful Peaceful Location enjoying Spectacular 180 degree Views over the Sand Dunes and Beautiful Countryside beyond as far as the eye can see, yet only a short walk to all the fabulous facilities the park has to offer. With Crisp Quality White Linen, Pillows and Duvets, which is wonderful so you can relax with a nice Bottle of Wine & a Box of Chocolates with our compliments. 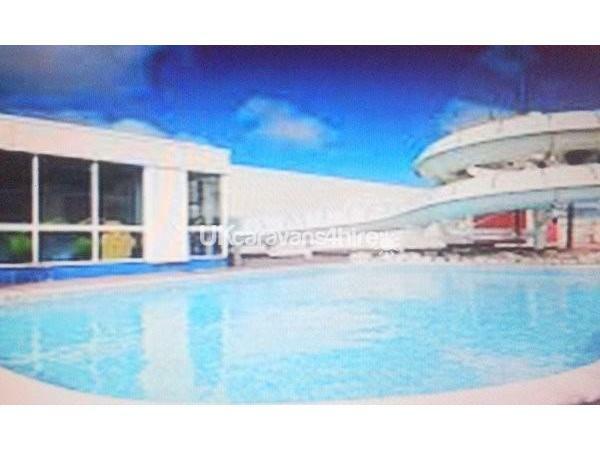 To make your holiday even more special there will be Two Luxury White Bathrobes to snuggle up (for holiday usage), 2 Pairs of Hotel Slippers, Bathroom Toiletries, Toilet Roll, and a Hairdryer too. NEW BOARD GAMES, TOYS FOR OUR YOUNGER GUESTS, JIGSAWS, BOOKS, DVD SELECTION, CHILDRENS TV, CHILDRENS PLAY TABLE AND SEATING AREA. We have a WII GAMES CONSOLE to keep them happy too (please bring your favourite games). Driftwood Caravan is situated in a wonderful peaceful location not on a main thoroughfare in the Delightful Holywell Bay area of the park, making it lovely and safe for children, there is a tarmac parking space outside the caravan with paved path leading directly to the front door and Decking Area. 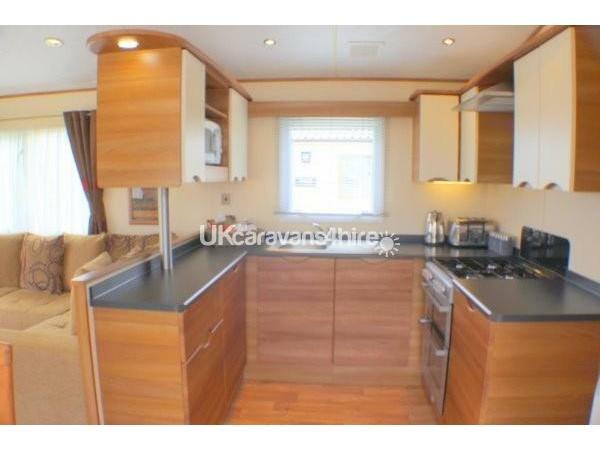 To the left of the caravan there is a large grassed area perfect for sunbathing and the children to play safely. 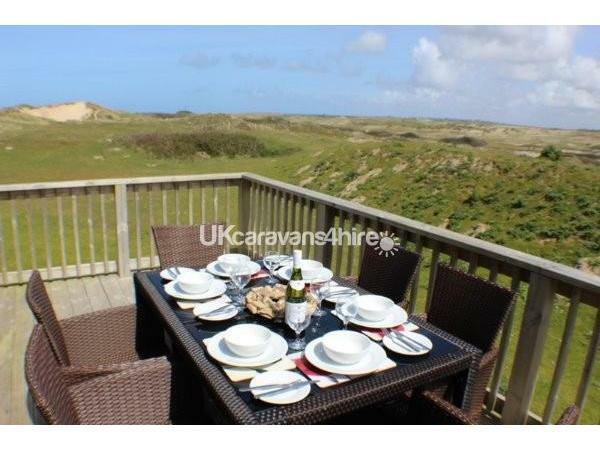 There is a Lovely BBQ especially for Dad which is located on a paved area perfect for alfresco meals. 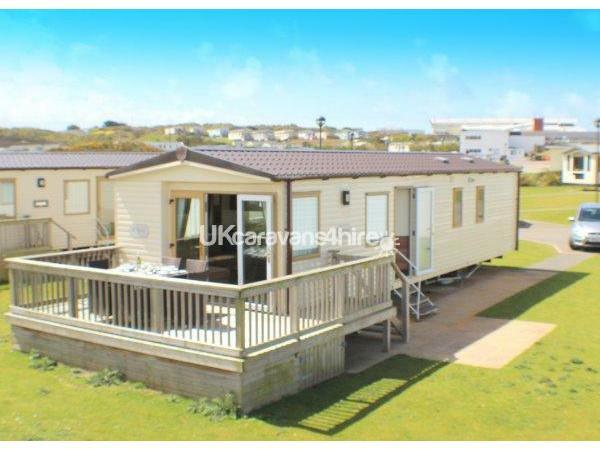 The Wonderful Large Decking Area is accessed via steps leading from the garden or directly from the Large French Doors in the caravan. 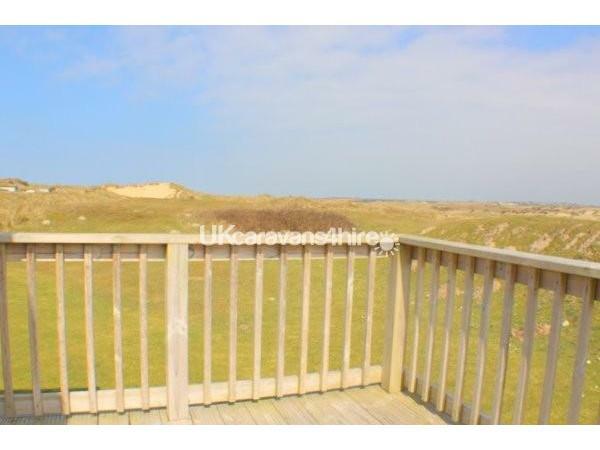 The Fantastic Views from the decking area are simply breath-taking across the sand dunes to the countryside beyond as far as the eye can see. 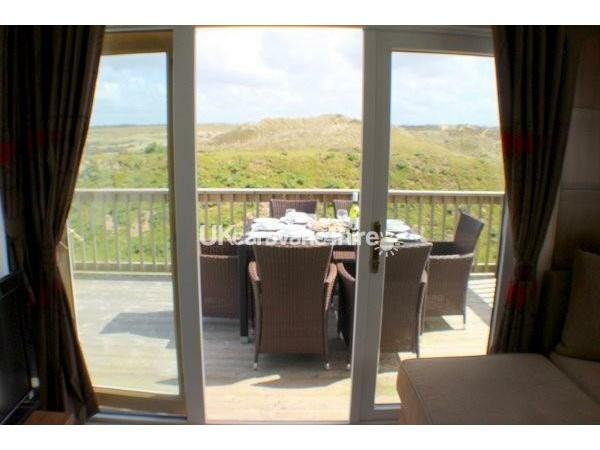 This area is furnished with High Quality Wicker Style Comfy Seating with cushions and Large Dining Table and is the perfect place to sit back, relax and enjoy a lovely meal with your family taking in the glorious views. In front of the caravan there are acres of grounds for the children to play and discover under the supervision of their parents, who can sit and relax on the decking with a nice cool drink. 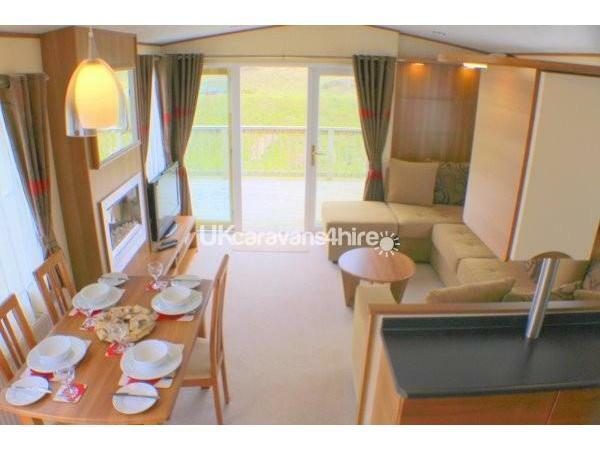 Driftwood is an ABI St David 38ft x 12ft Platinum top of the range Luxury Caravan and its detail, comfort and style has been designed to enhance your holiday experience. 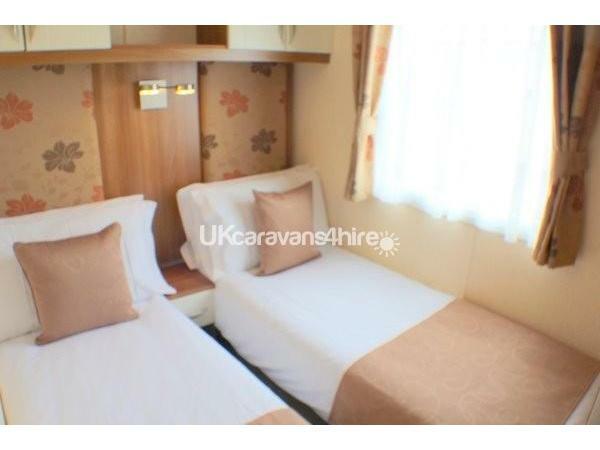 There are 3 Delightful Bedrooms, one Ensuite Toilet and Family Bathroom. Central Heated and Double Glazed for additional comfort. 3 steps with handrail lead to the entrance of the caravan, upon entering you will be delighted at the lovely light and fresh atmosphere and your eyes will automatically be drawn to the Large French Doors and the Uninterrupted Spectacular Views Beyond. The beautiful lounge and dining areas have been designed with both style and comfort in mind. There is a Dining Table and Four Chairs leading to the stunning lounge area with large French Doors leading out to the decking, the large seating area is very comfortable indeed with luxury fabrics and cushions. There is a central fireplace with Contemporary Modern Electric Fire, 2 Radiators a New 50 INCH Flat Screen TV with DVD Player and Wii Games Console (please bring your favourite games with you). There are beautiful book shelves with internal spotlights and cupboards containing an assortment of New Games, Books, Jigsaws and DVD’s to keep the whole family entertained. A door leads to a corridor where you will find a Lovely Modern Family Bathroom with Large Shower,WC, Washbasin and Heated Towel Rail. 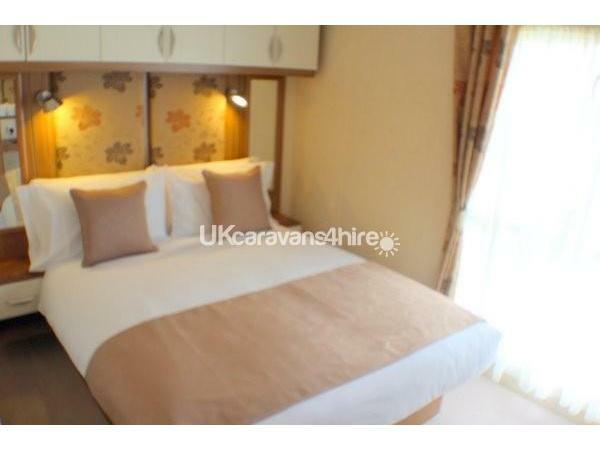 There are Two Delightful Twin Bedrooms with Quality Mattresses, Wardrobe and Radiator. 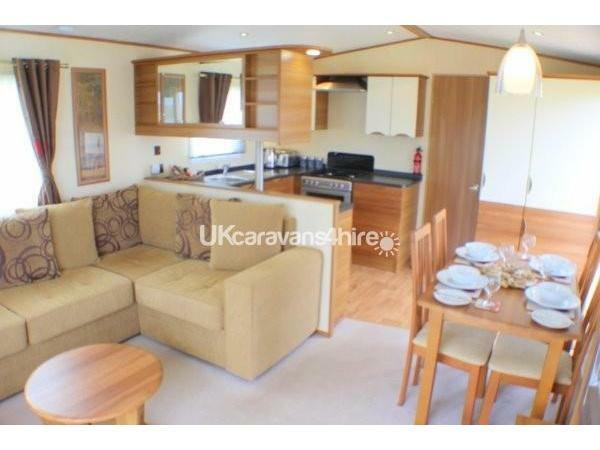 The beautiful spacious master bedroom occupies the entire rear area of the caravan with a large floor to ceiling window making the room very light and fresh. 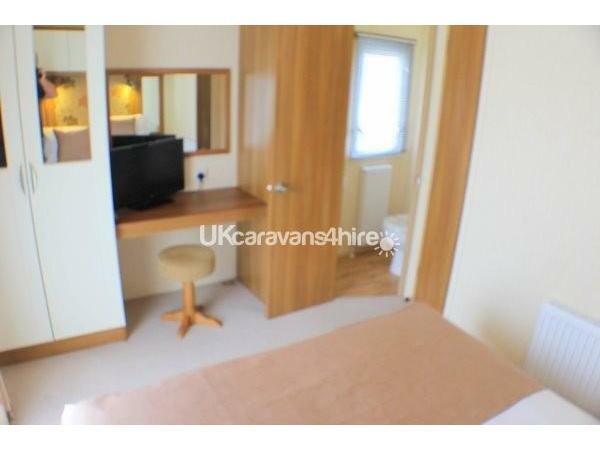 The room has been very cleverly designed to incorporate a Comfortable Double Bed with lovely wooden furniture including a New Television with DVD especially for Mom, a Vanity Unit, plenty of wardrobe storage and its own ENSUITE TOILET and Wash Basin. To make our guests feel very special indeed there will be 2 Luxury White Bathrobes (for your holiday usage), 2 Pairs of Hotel Slippers, Bathroom Toiletries and Hairdryer. including Quality Linen, Quilts and Pillows, Drink Welcome Pack including Tea, Coffee, Chocolate, Sugar, Milk & Biscuits, 2 x Toilet Rolls, Tea Towels and Bathroom Toiletries. We genuinely care very much about our guests and oversee all the cleaning and preparations ensuring the caravan will be beautiful upon arrival. For Guests total peace of mind we have a 24 hour emergency help line, A Guest Welcome Book, which includes lots of information about your caravan and how to operate all appliances, Emergency Phone Numbers, Cornwall’s Beautiful Beaches and Places to Visit. Guests can be as active as they want or take it easy. The park has everything for everyone and includes: A wonderful Indoor Heated Swimming Pool with Rapid Water Flume, Outdoor Heated Fun Pool and Terrace, all weather Football and Basketball Sports Courts, Children’s Playparks, 4 Seater or Single Peddle Bikes to discover the park, Indoor Soft Play Area, Activity Centre, Adventure Mini Golf, Archery and Fencing. The famous Haven kids club has activities all day and evening to entertain the children. Thank You very much for taking the time to view Driftwood Caravan today and if you require any further information or have any additional questions at all please do not hesitate to contact us via the enquiry form on the website and it will be a pleasure to assist you. Additional Info: Guests do not require a membership pass during the day to enter the Amusement areas or Entertainment Venue, Passes are required after 5pm only. Guests do not require a membership pass during the day to enter the Amusement areas or Entertainment Venue, Passes are required after 5pm only.